Seven C's Unit 301 is located in a BRAND-NEW oceanfront complex, featuring direct beach access, a community swimming pool and wonderful ocean views. This unit is a north-side wing unit with 2 private balconies, providing plenty of space to enjoy the views, sounds and fresh air without being in the direct sun. 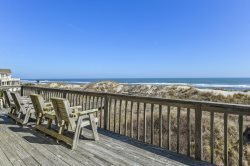 The home is located in the heart of the Outer Banks at milepost 7.3 in Kill Devil Hills. Great beach shops, restaurants with tasty local flavor and fun attractions are within walking distance or a short ride. The complex features direct beach access, a large oceanfront swimming pool, outdoor shower facilities and grilling area. A dedicated, covered parking spot keeps your car cool all day, and an elevator makes loading and unloading a breeze. Step off the elevator and you are at your vacation home. All on one level, this very tastefully decorated and well-equipped condo includes a King master bedroom, Queen bedroom with adjacent full hall bathroom, and a Queen sleep sofa in living and dining area. A counter-height dining table with seating for 6 provides great ocean views while you eat, and bar area with 4 stools provides additional seating area for your drop-by guests. Two large private balconies offer both west-side and oceanfront views. A custom-built cocktail bar on the oceanfront deck provides a great ocean view ambiance to relax and enjoy the sound of the surf without roasting in the sun. It's a perfect way to cap off a day at the beach. Langman's Sea Cabin is also equipped with its own washer and dryer and comes with a collection of books and games for those times you need to be out of the sun!. Need more than one unit? Additional Seaside Vacations homes in the same complex: TSC203, TSC305, TSC404 & TSC405. Main Level: King master bedroom, Queen bedroom, full hall bathroom, living and dining area with 2 private balconies with custom-built cocktail bars. Back deck offers ocean views.